It turned out that one of the girls was best friends with one of Andy’s former roommates, who gave him a good review. After snacks and several bottles of champagne the young-uns went out on the town while Rick and Cheryl and I had a nightcap at Blanco. There was talk of another 20-something outing for Monday night, after Andy’s and my second day in Belleville, but thunderstorms were predicted so everyone stayed in. On Tuesday Andy and I walked over to the Musée des Arts et Métiers. He loved it as much as I expected. I’ve taken so many pictures in prior years that I only added a few to my extensive [Musée des Arts et Métiers Photo Set]. The museum is hard to describe but here’s a try: It’s an historical museum of engineering, design and science; basically the attic where every French gadget that’s too cool to throw away ends up. Loved this diving suit! It never worked but has nevertheless become something of a steampunk icon. We had lunch at the nearby l’Absinthe Café so we could easily return to finish the museum. It used to be a classic neighborhood restaurant, recommended by my friend Elliot, who formerly lived in the area. I have seen it change over the years, adding burgers a few years ago and this year doubling or tripling the price of a carafe of wine. It’s still ok but I miss the old days! For dinner we walked over to Bouillon Chartier, an old favorite that has retained its classic character, despite being a tourist attraction. Bouillon Chartier. The cubbyholes at the right were for the napkins of the workmen who frequented the restaurant back in the day. At Bouillon Chartier you are seated with other patrons. This couple met when they were both 20; the American guy was a serviceman stationed in France, the woman was a local girl, and the rest is history. We had a lovely conversation with them. With new friends at Bouillon Chartier. When I mentioned that Andy had never eaten a snail the woman offered him one of hers. To my surprise, he accepted! Andy preparing to eat his first snail! We were still thirsty after dinner so we stopped off at Hoppy for what turned into a couple of beers. That only made us thirstier so we finished the evening at another old favorite, Experimental Cocktail Club. Mot du jour: Scaphandre rigide: Diving suit. You can never be sure when this may come in handy! Tuesday was a bit brighter so we set off to see the view from the base of Sacré-Coeur, the white-domed church on the top of Montmartre. Rue Montmartre starts near my place, at the foot of Saint Eustache, so we followed it through the faubourg, then took rue des Martyrs and many flights of stairs up to the top. The view was panoramic but too hazy for my postcard aesthetic. 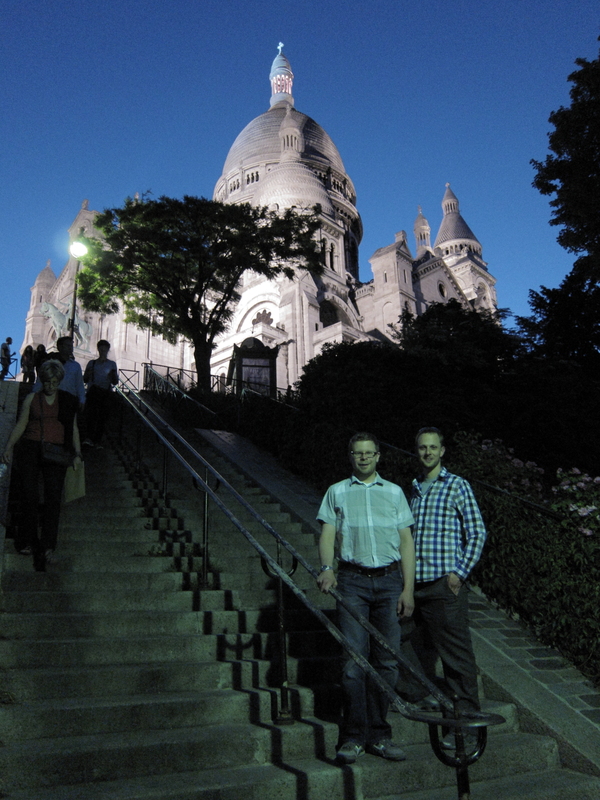 We both found the tourist crush around Sacré-Coeur off-putting, but we enjoyed the much calmer and much older St-Pierre-de-Montmartre that shares the summit. 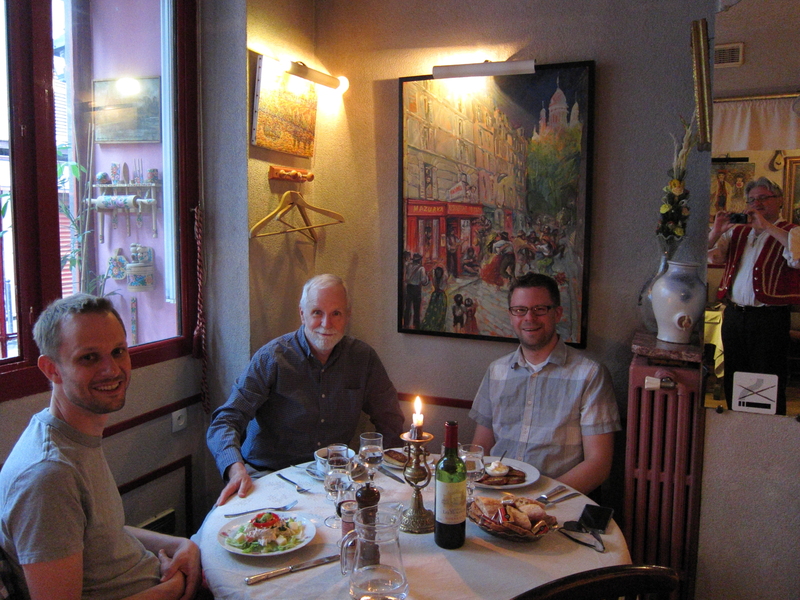 We had a late lunch at Chez Ginette, a modest but pleasant restaurant just above the Lamarck-Caulaincourt métro station. The food was fine and the view was unbeatable. After eating we strolled over to posh Parc Monceau. It was later than I usually see the park and there was a steady stream of joggers. We read our books for a while, trying not to let ourselves be distracted by the passing parade. Then we headed over to the Arc de Triomphe. I made the classic error of mistaking the métro entrance for the underpass beneath the traffic mayhem of the Étoile, but after a brief diversion we found the correct entrance and explored the base of the monument. We had passed an attractive restaurant on our way up to the Arc de Triomphe so we backtracked a couple of blocks and had a good meal at Le Beaucour, in one of the posher neighborhoods of Paris. After regrouping at home we started our evening with cocktails at Experimental Cocktail Club — where I’m becoming a regular — then beers at our neighborhood bar Hoppy, then a special birthday visit to a gay bar that I had avoided all these years: Le Depot. Sherard had enjoyed the upstairs bar at Total Beur the previous Friday, but on Tuesday only the downstairs was open. It was just as sketchy as my friends had said! The physical space was clean enough but the few other patrons had a zombie quality that we put down to a single-minded obsession about hooking up. After finishing our beers we fled, sadder but wiser! Friday night was an epic bar crawl. I’m tempted to just refer the gentle reader to the Circe Chapter of Ulysses and leave it at that. But as a dedicated blogger I must try to record the experience! On Wednesday Sherard and I had visited Les Mots à la Bouche — the indispensable gay bookstore in the heart of the Marais. A friendly clerk invited us to the launch party on Friday for Garçon Magazine issue 4, so we arranged to meet Arturo there to start our evening. Meanwhile, Jared W got in touch to suggest coordinating with him and a friend so we suggested that he meet us there also. Then a young Chinese filmmaker who I had met once in Boston surfaced and asked if we could meet up this evening. So I invited him to meet us there as well. The more the merrier! Arturo was already at the Garçon launch party when we arrived, and a photographer was taking pictures for possible use in the next issue. Naturally the three of us volunteered; my guess is that our photo might just get in: How could they resist a handsome latino, a super-cute mixed-race guy and a charming much older gentleman? Then Jared W arrived with not one but four friends. We toyed with the idea of looking for a table for eight but eventually decided to go our separate ways for dinner. Then the filmmaker arrived, and showed every sign of wanting to spend the rest of the evening with me, despite the fact that I already had two excellent companions. I introduced him to the photographer and sent him over to have his picture taken, saying that I had to go back to my friends. That seemed to work, so Sherard, Arturo and I headed over to the Open Café for cheap happy-hour beers on their terrasse. Who should arrive, however, but the filmmaker, still lonely as a cloud! I walked him into the bar and introduced him to a sweet-looking Australian of my vintage to help him order a beer. Happily, this time my social engineering worked and we saw them later going into Quetzal Bar. Meanwhile, the three of us walked down to Les Souffleurs for cocktails. Arturo was scandalized when the bartender larded his martini with vermouth, but after much heated discussion he got an American-style martini, and ended up with a free drink. Who should we see as we left to find dinner but Jared W and his four friends! (This wasn’t as big a coincidence as it might seem, since Lisa’s Geoff had introduced both of us to the bar during Jared’s stay with me a few years back.) Jared and his friends had already eaten falafels on rue des Rosiers, so Sherard, Arturo and I went looking for a table for three. My favorite Bad Boys, Sherard and Arturo. Happily, we found one at an old favorite, La Chaise au Plafond. Their famous millefeuille appetizer wasn’t on the menu, since tomatoes were not yet in season, but otherwise the meal was up to my expectations. The only photo I took, however, was of the toilet — sorry, it was that kind of evening! The toilet at La Chaise au Plafond. Arturo almost touched hands with the person opposite, thinking that the hands he saw were his own in a mirror. After dinner we walked back to our own neighborhood (Arturo’s apartment was nearby) and had excellent cocktails at Experimental Cocktail Club. Arturo was feeling tired for some reason, so after a couple of drinks he headed home. Sherard and I were still thirsty, though, so we each had a distinctive craft beer at Hoppy, a brand new beer bar just down the street. We closed the place down, and had a nice conversation with the owner as we left. Sherard and I have been friends for years, and we’ve shared a glass of wine or two on many occasions. This is the first time we’ve traveled together, though, so when he first arrived I asked what his attitude was towards going out drinking. He said he was open to the idea, and he was true to his word! the Pompidou Center (the national museum of modern and contemporary art). “No problem!” (I thought!) Because it was closest, and in the gay-friendly Marais, we set out that afternoon to see the Pompidou Center, the national museum of modern and contemporary art. We started with an exhibition about the life and work of Paul Klee. It was large and comprehensive, although I was surprised not to see some of his most iconic images. These were a few pieces from the show that caught my eye. Also, I hadn’t noticed this piece before, which embodies the absurdity of some branches of conceptual art. The quai at the tip of Île Saint-Louis on June 1, 2016, at the start of the Great Flood of 2016. 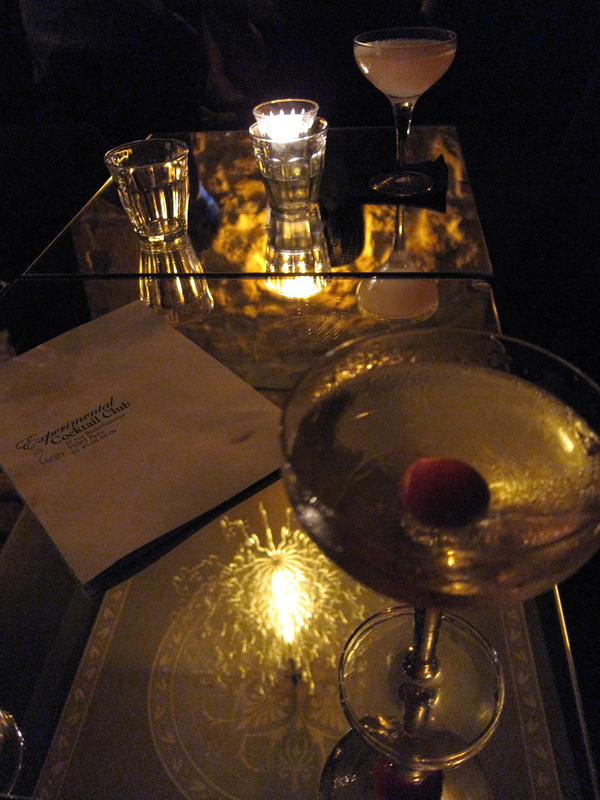 We ended the evening with cocktails at my old favorite, the Experimental Cocktail Club. The next morning Sherard was kind enough to give me moral support at a coffee date with Arturo, a guy I had been chatting with for a few years but had never met in person. He turned out to be great — handsome, smart and sweet! We made a plan to meet again for drinks that evening and continued on our way. We got our art fix on Thursday from less mainstream sources. First was a quirky show at the Gaîté Lyrique, a former theater that is now the neighborhood cultural center for the 3ème arrondissement. The show started out with some cute-ish computer enhanced image manipulations, then developed into a meditation on information gathering and surveillance, and on our mostly-futile attempts to protect ourselves. We had lunch at an old favorite, Nanashi in the Haut Marais. We both enjoyed our meals as well as the handsome and friendly waiters. Sherard with our Bento boxes at Nanashi in the Haut Marais. We spent the late afternoon seeing galleries participating in Les Jeudis Arty (Arty Thursdays) in the Marais, which now happens just three times a year. This exhibition space was as interesting as the works (which were on plastic tables suspended by wires from the ceiling struts). This piece was one of Sherard’s favorites. I liked several pieces by Lucas Talbotier at Jola Sidi Gallery. I was pleased to learn that the handsome young artist will be spending a semester at Rhode Island Institute of Design (RISD) starting next January. We exchanged contact info and I hope I’ll have an opportunity to show him around Boston next winter. My favorite gallery of all was the Galerie Linz, hidden at the back of a courtyard. I liked almost everything but my favorite piece was a remarkable balanced stone sculpture. After a minor SNAFU we met up with Arturo and had a beer at the Jeudis Arty after party at the Carreau du Temple, then decamped for cocktails at Le Mary Celeste. 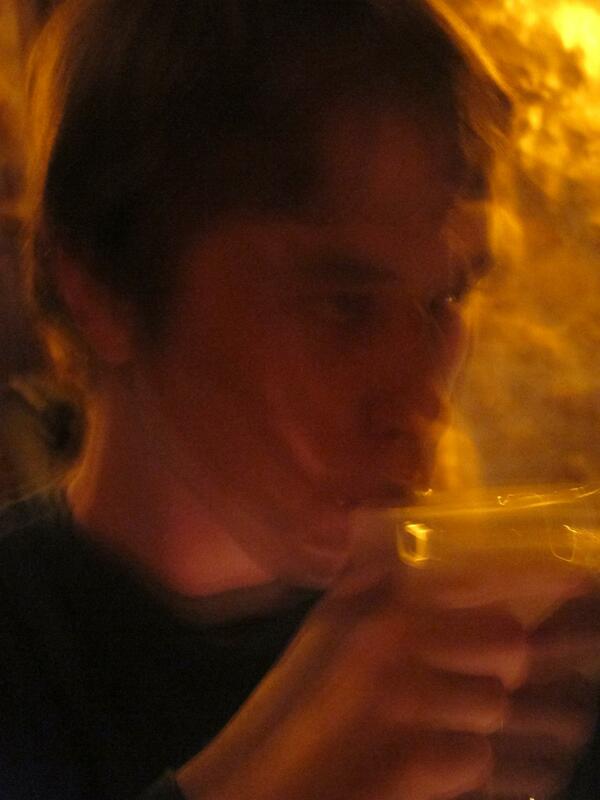 The drinks were fine and the atmosphere was nice but the service was lackluster. We then tried the Experimental Cocktail Club, but we couldn’t get in because it closes at 2 pm on Thursdays. By this point we were close to home so Sherard and I invited Arturo up to the apartment and we ended the evening with a few glasses of wine. Monday was the last day in Paris for Matt and Chris. Our first plan was to get the view from the top of Sacré-Coeur, but Chris was feeling a bit under the weather so we switched to something that didn’t involve so much climbing: a boat trip on the Seine. It was 100% touristy but actually rather fun. 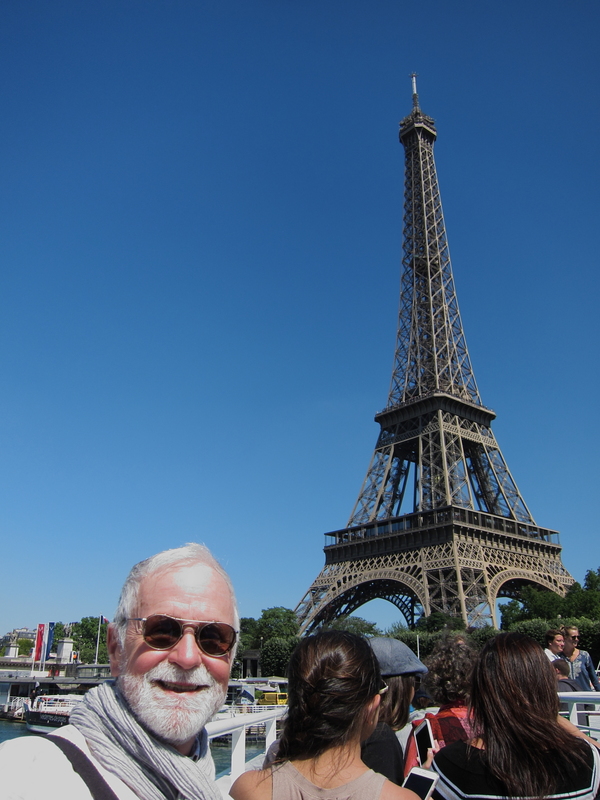 A selfie of me with the Eiffel Tower taken on a Bateau Mouche. Could anything be more touristy? 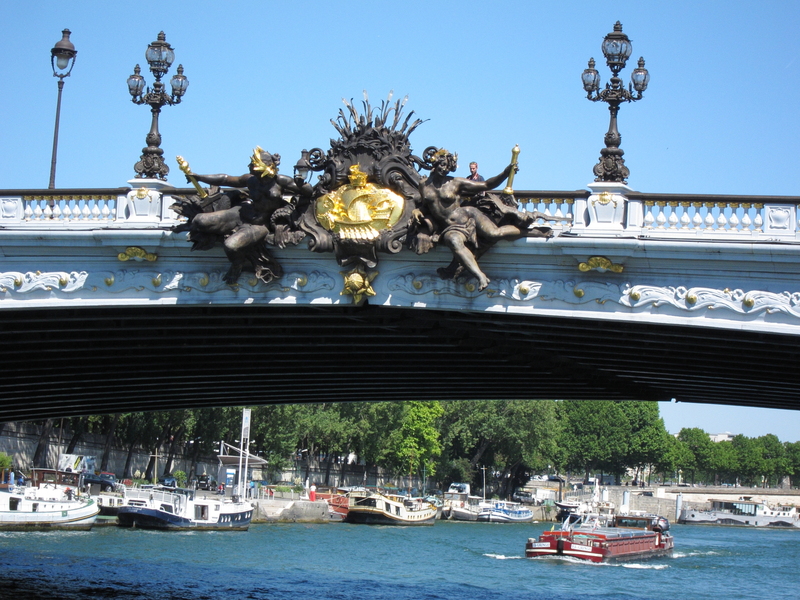 Detail of the most beautiful bridge in Paris, the Pont Alexandre III. You can’t get this view from shore. Revisiting from the water side so many buildings we had seen from the land made this a rather good way to round out their visit. 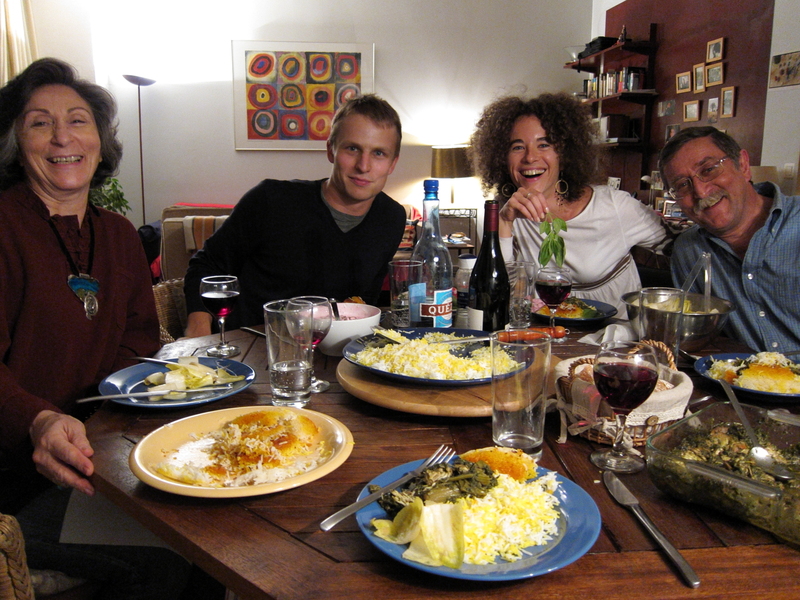 That evening Matt and Chris made their last home-cooked meal – with fresh pasta from a market on rue Montorgueil — and I headed out to meet my nephew’s girlfriend Gillian, her mother and her brother Rob for dinner. Gillian had been traveling through Europe for weeks, and her mother and brother had joined her in Paris a few days before; this was also their last day here. 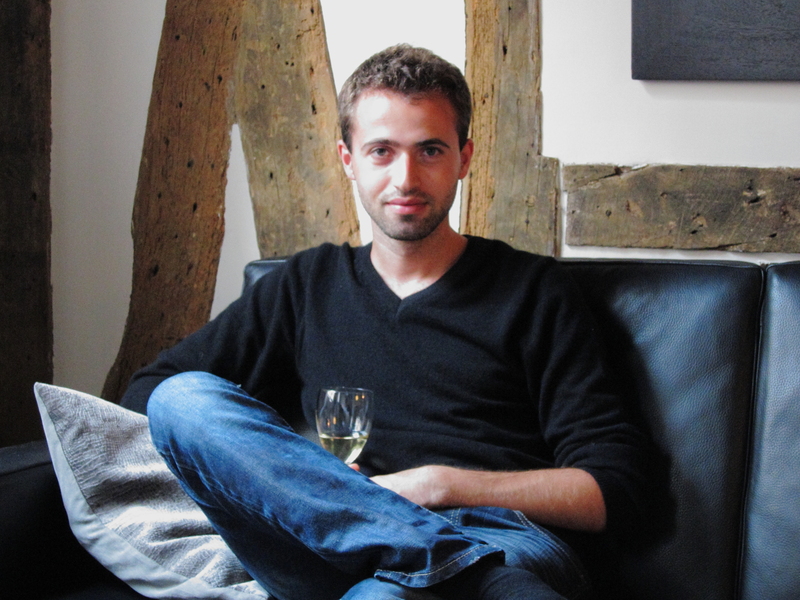 We met at the Sentier métro station, then strolled down rue Montorgueil looking for a good place to have an apéro. We settled on a corner table at Blanco that was sunny but not smoky. We all had kirs, with different flavors of liqueur. Then we foraged for a meal. We settled on La Faille, a relatively new restaurant on rue Montmartre that I hadn’t previously tried. I was impressed with the decor and the very energetic service. I also liked the way the owner chased away a panhandler who started bothering us. 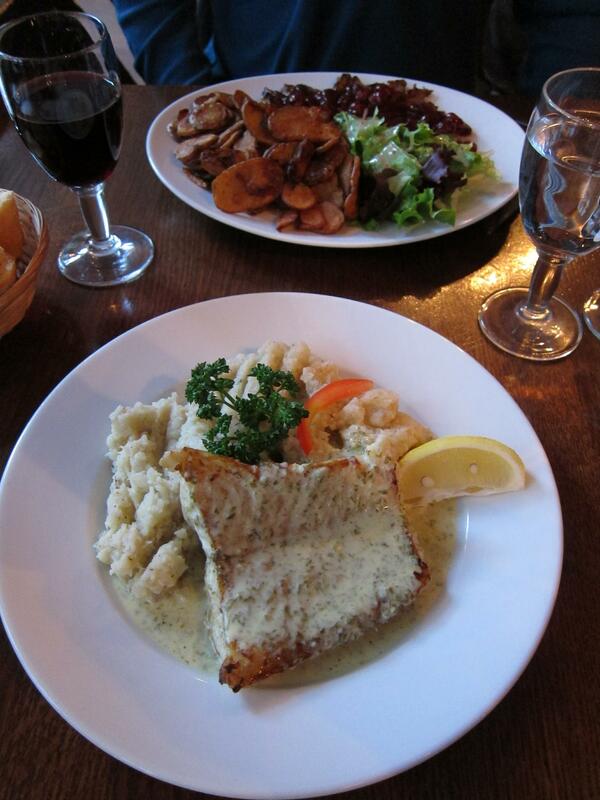 The wine and food were both quite good, and the price seemed consistent with other good restaurants in Paris. 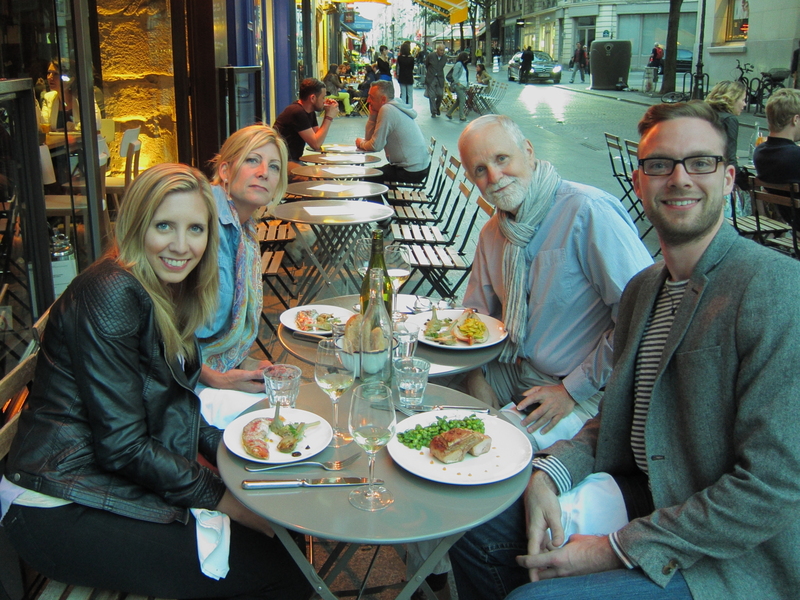 Gillian, with her mother and brother at La Faille on rue Montmartre. 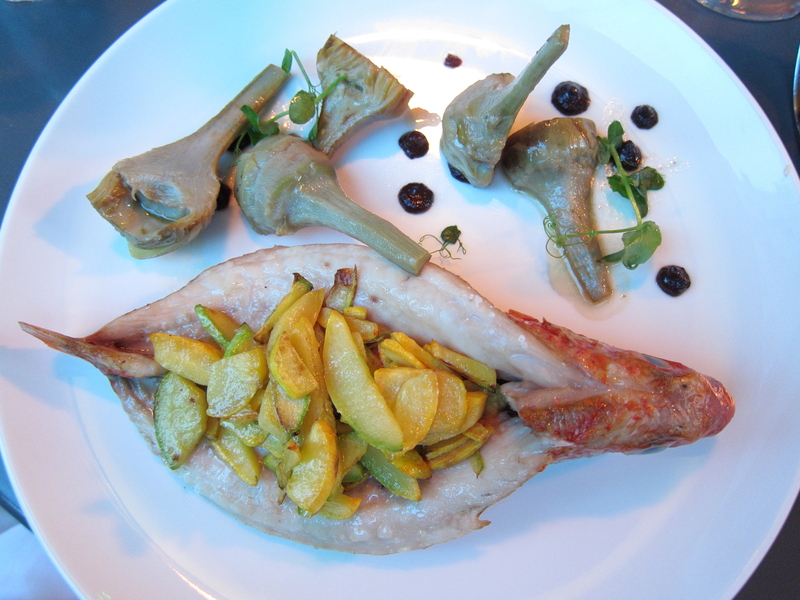 My rouget barbu at La Faille on rue Montmartre. After wishing them a good trip home to Chicago I headed back to my apartment around midnight. Normally I feel quite safe in the neighborhood, but this evening three young men were loitering around the door to my apartment. Young men loitering about my apartment around midnight. Chris had made only one culinary request — aside from not taking him to any more restaurants where there’s nothing he can eat — which was to dine at a Polish restaurant, serving the kind of food his mother makes. Thursday was his night. Chris chose a place called Mazurka, and since it was nice out we set off for a half-hour walk rather than taking the métro. After the first ten minutes I was no longer familiar with the neighborhood, except that we were climbing so much that we had to be going up Montmartre. The restaurant is in a somewhat run-down part of the 18ème, but it looks rather cute. Chris and Matt had a flashback to the empty restaurant we had fled on our first night but I reassured them that we were just on the early side, and that this place looked fine, as indeed it proved to be. 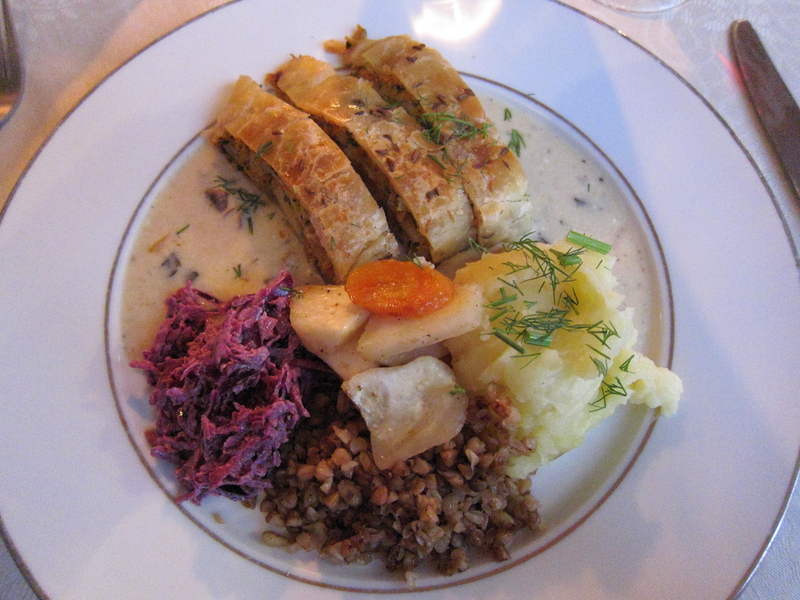 Polish isn’t my favorite cuisine but I have to admit that this plate was pretty darn good. We had been noticing tantalizing little views of Sacré-Coeur as we climbed up to the restaurant, and on the map it seemed to be quite close — just a few little streets away. So I suggested we stroll over, imagining that we were already more-or-less on top of the hill. The church was lovely by night, however, as was the view from the plaza. 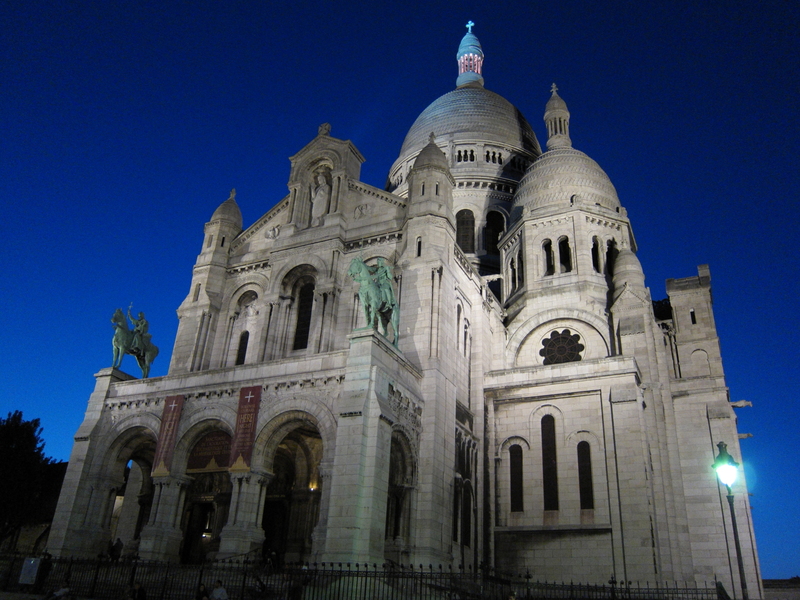 Sacré Coeur looking nice after dark. Just as Matt and Chris were about ready to forgive me for taking them up all those steps I made an even more serious mistake. I let Google Maps navigate us back to métro Château-Rouge. After midnight. I knew better, but we were all tired and this was both the closest station and on a line that took us directly home. Almost everyone else on the platform was drunk and rowdy. We were also amost the only white people. One guy in particular staggered in my direction and seemed to be planning to accidentally-on-purpose fall on me, which would have been unpleasant at best, and would have cost me my wallet and/or cell phone at next best. Chris, though not tall, is trained to deal with aggression, and he was braced to act if the guy got much closer. For some reason — quite possibly Chris’s glare — the guy changed his mind and the train arrived and whisked us safely back to our cozy neighborhood. Note to self: avoid Château-Rouge after dark! 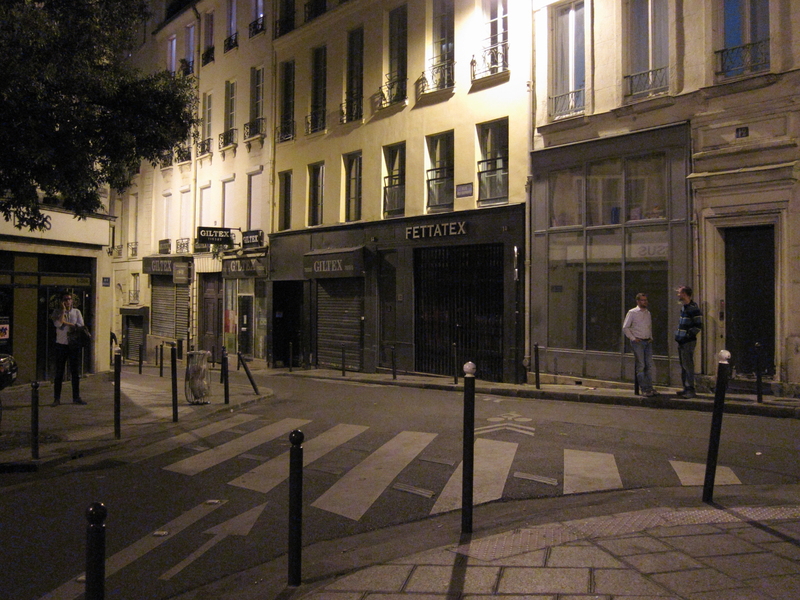 Our walk back home took us up rue Montorgueil past my former apartment on the corner of rue Saint-Sauveur. I suggested the possibility of rounding out the evening with a cocktail, and hearing no dissent guided us a few doors down to the Experimental Cocktail Club, the first of a current flowering of bobo cocktail establishments in Paris. It’s in a tiny speakeasy-like stone room. It was busy but not jammed and we only had to wait a few minutes for seats. The service and patrons were friendly and the cocktails washed away any anxieties that might have arisen at Château-Rouge. A nightcap at the Experimental Cocktail Club on rue Saint-Sauveur in the 2éme. Our refreshing drinks at the Experimental Cocktail Club. As we were about to go Matt chided me for not eating the cherry in my drink, but warned me about the pit. His warning was unnecessary, however, since it was actually a radish. 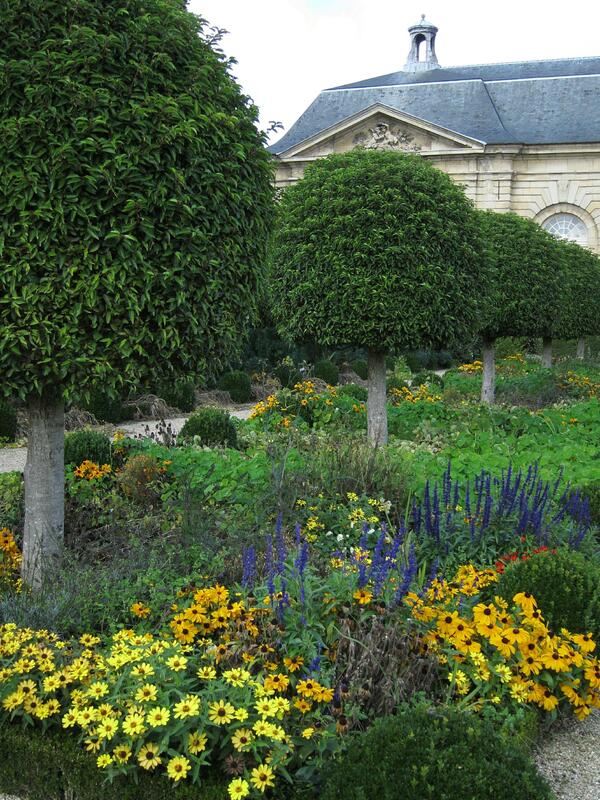 Yet Another Spring in Paris! Location is of course a primary consideration. I wanted to rent near the center of the city, in or near an animated area (bakeries, food stores, shops, cafés, restaurants, etc. ), but not in an area that is too heavily trampled by tourists. 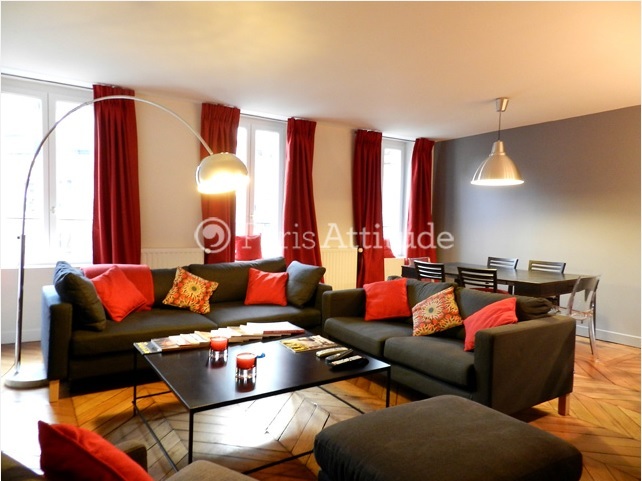 This apartment is two blocks from bustling rue Montorgueil, which is active without being too touristy. The only wild card is whether daytime commercial activity on rue des Jeuneurs may be somewhat annoying. I’m sure it will be quiet at night, though, and while I loved looking out on the activity of rue Montorgueil I think it will be a lot easier to get to sleep in this apartment. Decor. Last year’s apartment was very well located, but it looked a bit rundown from the photos, and it turned out to be dirty and poorly maintained. It was 500 euros per month less than this one, but when you are spending 6-8 weeks in a place you really do want it to be pleasant. The photos of this place make it look truly inviting, even though it lacks the exposed beams that have graced most of my previous rental places. Stairs/Elevator. My first year both places I rented were on the French 5th floor — five flights up — with no elevator. The stairs weren’t a physical challenge but I felt psychologically distanced from the ground. For example, I would sometimes eat a stale baguette for breakfast instead of going down to buy a fresh one! In subsequent years I’ve rented on the French 3rd floor and had no issues. This apartment is on the French 3rd but also — a first for me — has an elevator! I hope I’ll mostly use the stairs but it will be nice not to have to schlep my big suitcase up three flights when I arrive. Amenities. High-speed internet and WiFi are now typical, but it would be a huge inconvenience to rent somewhere that didn’t offer them. I like a place with a washer/dryer, keeping in mind that most French units do a poor job of drying so you must plan on hanging most of your clothes anyway. A dishwasher isn’t essential, but is nice to have. I personally like to have a desk and chair for my computer, which this place offers. Jason and I had planned to rent bikes at Versailles on his last day in Paris, but the forecast was discouraging so we made it a museum day instead. After a sleepy start we set out to search for Breton food, and landed at the Bar du Marché des Blancs Manteaux on rue Vielle du Temple. The service and decor were nice, and we had pretty good gallettes (similar to crêpes but made with a different batter and with a salty filling) despite the iffy Yelp ratings. After lunch we visited the Carnavalet, the museum of the history of the city of Paris. It’s a wonderful omnium-gatherum of art and artefacts relevant to Paris that don’t quite make the cut to get into one of the fine art museums. It’s hard to give any real idea of the scope of the collection but here are a few pics. 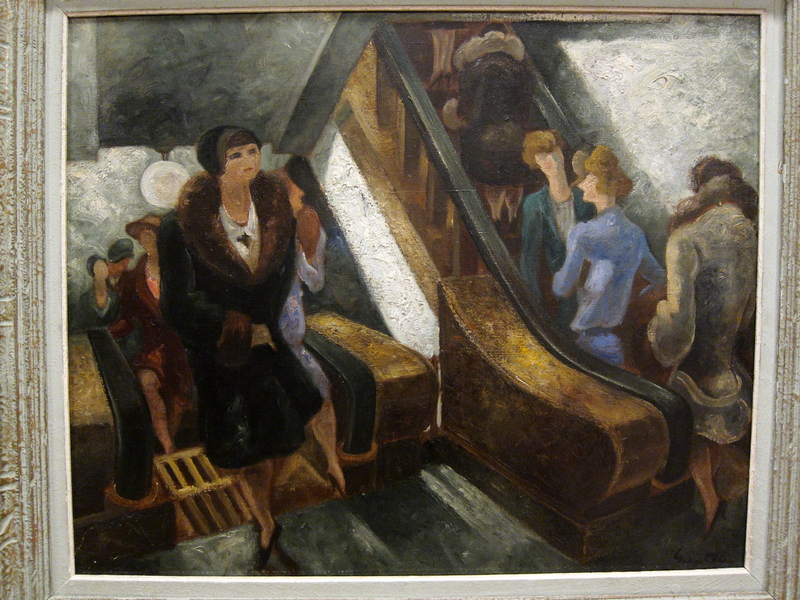 Yves Alix, L’escalier roulante (1928). 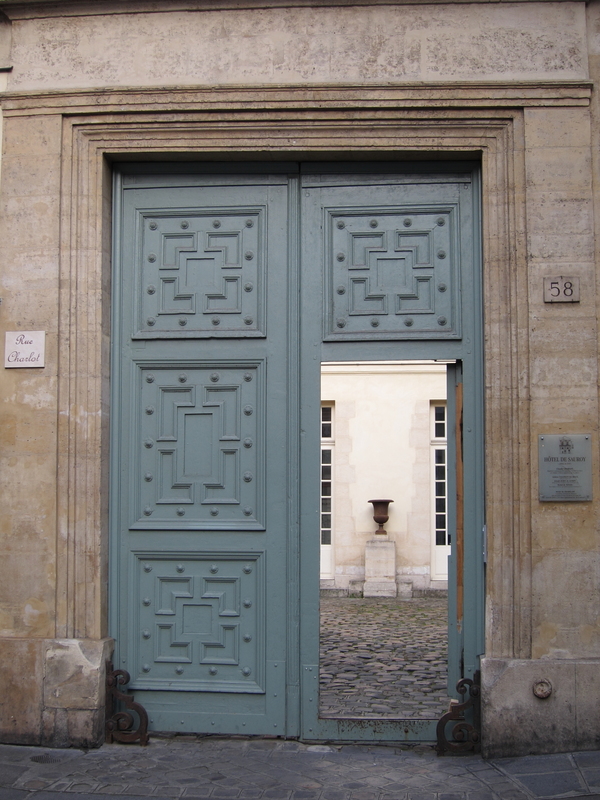 Musée Carnavalet. 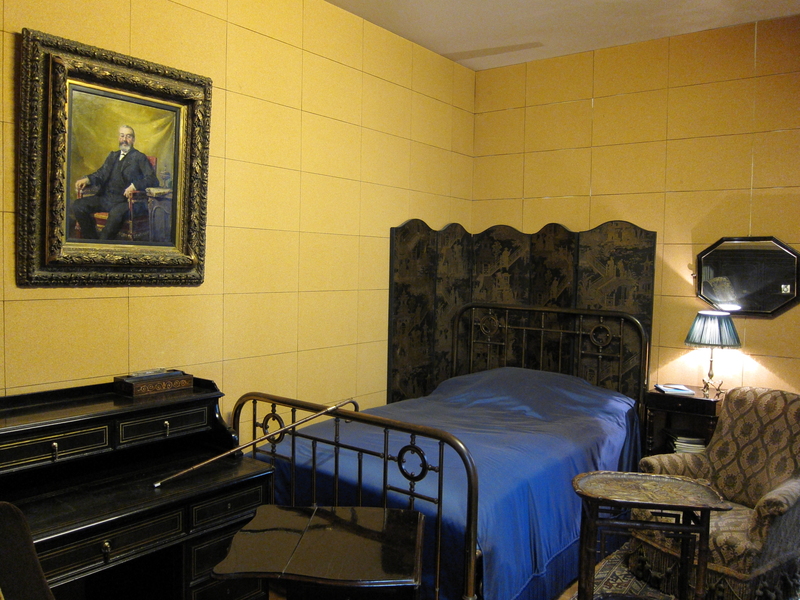 Marcel Proust’s cork-lined room at Musée Carnavalet. 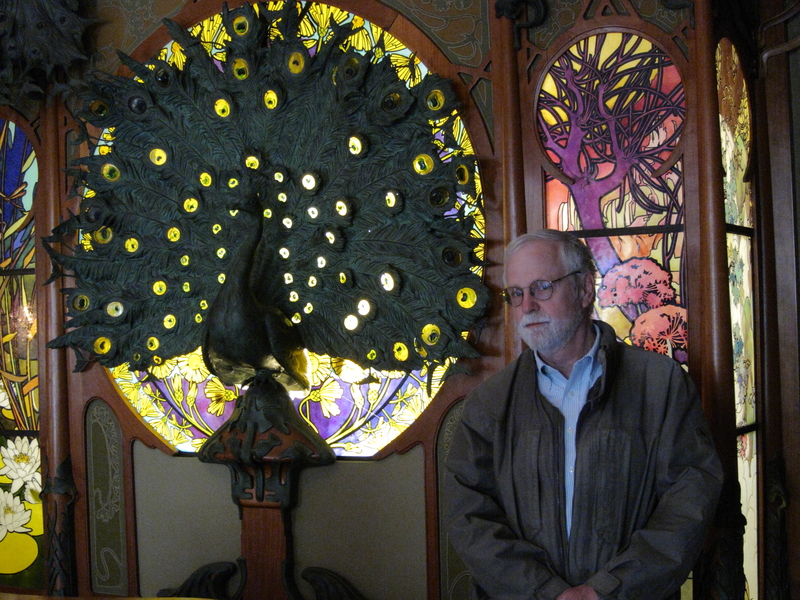 Bob with art deco peacock at Musée Carnavalet. After the museum Jason and I shared a delicious apricot-pistachio tart, did some shopping and took afternoon naps. Then we headed out to Nanashi for dinner with my French friend Alexis. As we were waiting outside the restaurant this tranquil doorway caught my eye. Hôtel de Sauroy, rue Charlot in the Haut Marais. After a good meal, and a good conversation, Alexis led the way to Candelaria, a hip cocktail bar quite nearby. The entrance is through a tiny, garishly-lit taco bar, but if you get past the doorman you’re ushered through the back door into a large, candle-lit bar, reminiscent of the Experimental Cocktail Club in Montorgueil. 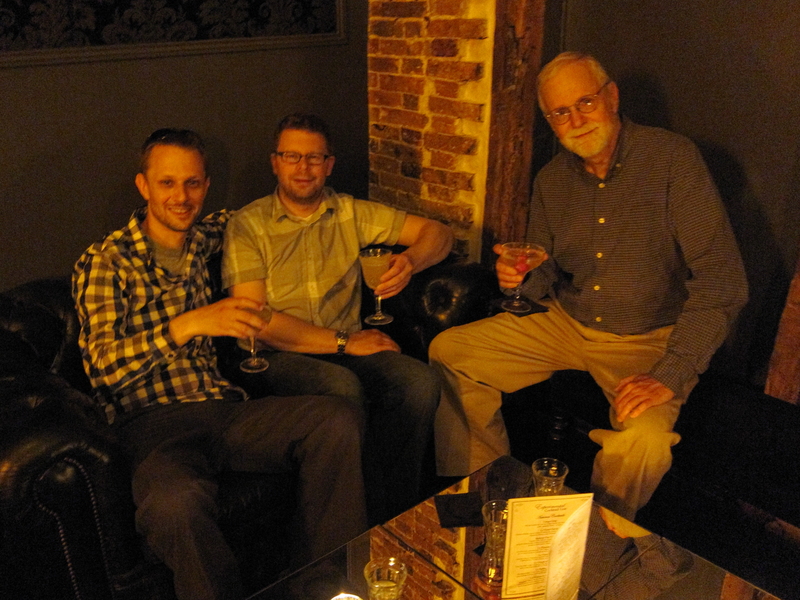 We enjoyed tasty and remarkably complex cocktails, and more good conversation, as a fitting end to Jason’s visit. 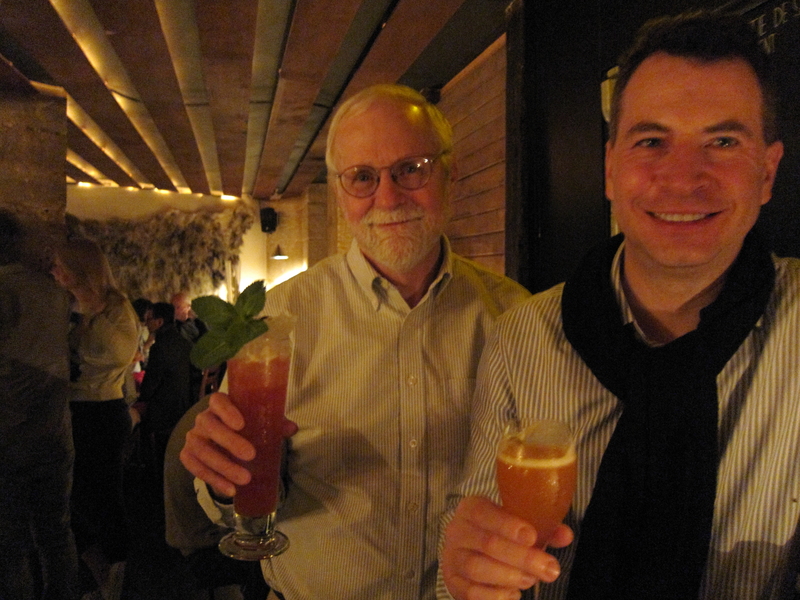 Bob and Jason toasting Alexis at Candelaria. This morning Jason packed, ate a quick breakfast and headed to the airport. In an excess of caution I checked the RATP Etat du Réseau site in case there might be any delay. It was lucky I did since the train to Charles de Gaulle airport was skipping Châtelet due to an abandoned package! We figured out an alternate route and Jason is on his way to Bulgaria for the second part of his European trip. After our half-marathon Monday (which, by the way, included the equivalent of 53 flights of stairs, per my fitbit) both Brian and I were ready for a quieter Tuesday. He went off to the modern art museum of the city of Paris, then wandered over to the nearby Tour Eiffel. I slept in, blogged, and was still here when he got back! We had dinner at L’Absinthe Café, a neighborhood restaurant in the nearby Arts et Metiers quarter that Elliot Marks had recommended years ago. I was mildly horrified when the waiter gave us English menus, but at the end of the day it lived up to my claim that it primarily catered to nearby French residents. We rested after dinner, then walked a few doors down rue Saint-Sauveur to see whether we could get into the Experimental Cocktail Club, which I had enjoyed several times over the last two years. I had been concerned about Brian’s jeans, but that proved not to be a concern. The issue was whether we were cool enough! The doorman was affable but insistent on my answers to a series of questions (en français, bien sûr). First off, he needed to know whether I have been there before, which of course I had, on several occasions. I also claimed to know one of the owners (though not by name). Then it was important for him to know whether I was “leading” (amener) young Brian. I wasn’t exactly sure what this meant but I claimed that I was. For whatever reason, we made the cut and were invited to enter. There were two dj’s spinning mellow music, and excellent experimental cocktails, in a cosy little room. Brian with an experimental cocktail. Brian’s petit séjours in Paris made a nice bookends to his Grand Tour. He got away early Wednesday morning to catch his flight home. But not until he made the baguette run — the first time one of my house guests has been so thoughtful. He also offered me his spare U.K. adapter; at first I declined but then I realized that I was really going to need one during my short trip to London later in the month, so I gratefully accepted. The day was cloudy, with predicted showers, so I booked the Dynamo show at the Grand Palais, which surveys the last hundred years of art involving light and/or movement. I tend to like those types of art — which can mimic the pleasures of an amusement park or fun house. But I was blown away by the size and quality of this show. 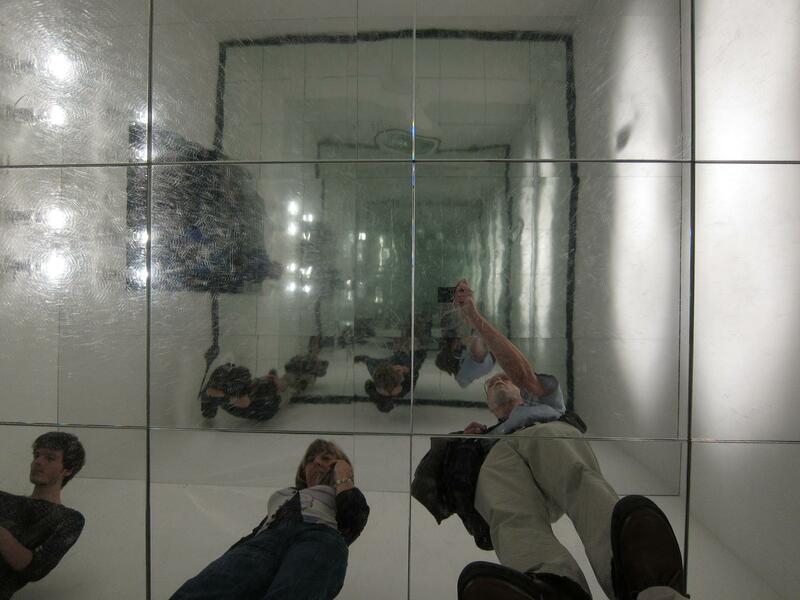 The exhibition must be ten or fifteen times as large as the entire Boston Institute of Contemporary Art. At several points I thought to myself that the show had been cool, and well worth the price of admission; but then it went on and on! Light and movement calls for video, so I’ve posted a few clips on YouTube, as well as a still photo set on Picasa. 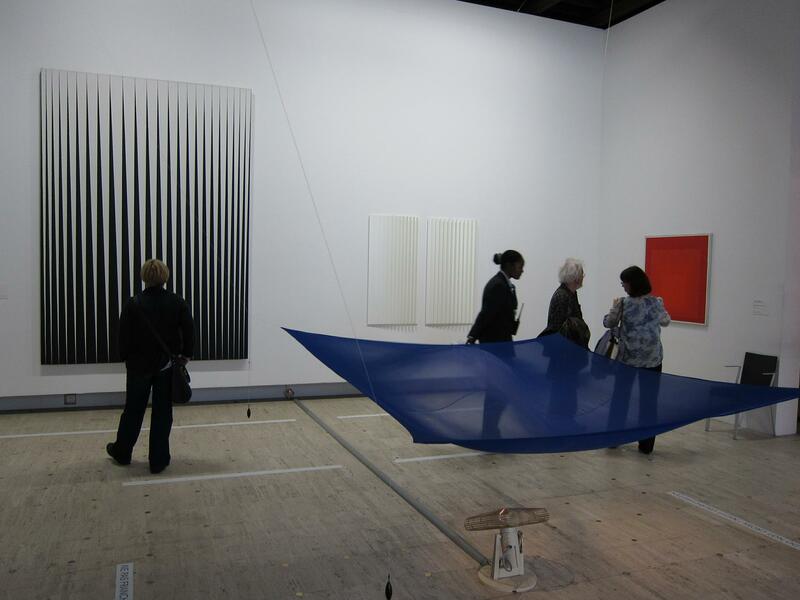 One of dozens of rooms at Dynamo, at the Grand Palais in Paris, June, 2013. 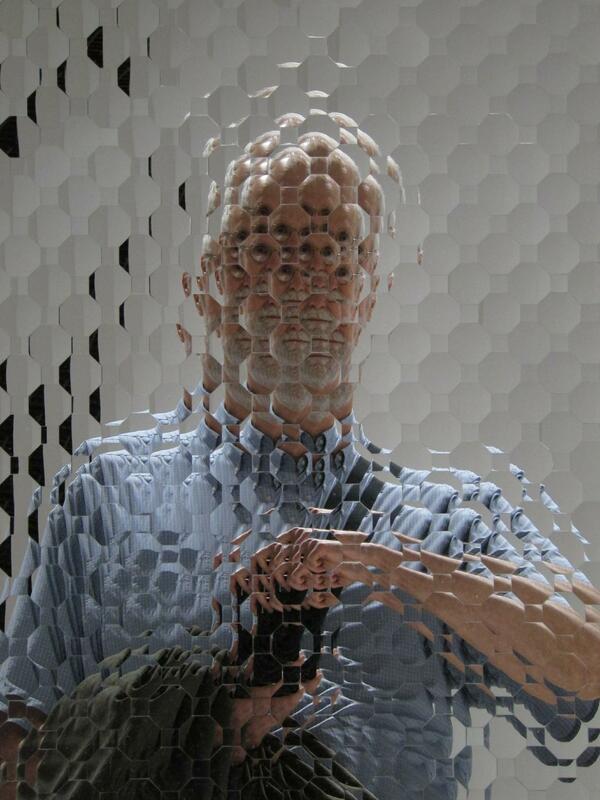 Anish Kapoor’s Islamic Mirror, 2008. There were several variations on the theme of a hall of mirrors in the show, but I had never before seen a vertical hall of mirrors. Meanwhile I’ve also done several loads of laundry, etc. Fortunately, I love playing house. Jared arrives on Monday morning so I have a few days left to my own devices, apart from several evening plans. Mot du jour: « cheese cake ». Playing the language game with our waiter at L’Absinthe Café I ordered « un gâteau de fromage » to share even though he had given us English menus. He explained that the French term for “cheese cake” is « cheese cake ». Addendum: A Canadian friend subsequently explained that in Quebec it’s illegal to use English terms like “cheese cake” on menus, so there they in fact do call it « gâteau de fromage » !